The California Water Law Symposium, now in its eleventh year, is a unique collaboration among Northern California law school students that focuses on discussion and analysis of California water issues by leading water law and experts. At the symposium, six panels tackled a variety of issues, including the Russian River frost protection regulation, agricultural water efficiency, and fair pricing and the right to human water. To kick off the symposium, Professor Paul Kibel with Golden Gate University School of Law, Harrison “Hap” Dunning with the UC Davis School of Law, and John Leshy with UC Hastings College of the Law discussed the importance of the history of reasonable use law. The decision was broadly criticized, because even in 1926, the state was facing strained freshwater sources, he said. “To many it just seemed untenable for the law to uphold a doctrine in which the unreasonable and wasteful use of water by anyone was found to be legitimate,” he said. This language in the California Constitution was adopted virtually wholesale into the California water code, so the provisions of the California Constitution and the California water code provide the statutory basis for what we’re calling California reasonable use law, Professor Kibel said. He then cited some examples of the ways the Reasonable Use law has been relied on either by the courts of by the State Water Board since that time. Professor Kibel pointed out that Resolution 7578 was not limited to surface waters; it included both surface waters and groundwater. “So we see that 40 years ago the State Water Board already looking to its authority under Reasonable Use Law to regulate and impose limitations on the use of groundwater,” he said. “The California Court of Appeal concluded ‘the claim that Forni’s direct diversion of water constitutes an unreasonable use and an unreasonable method of use is predicated on the premise that the direct company results in a great temporary scarcity of water during the crucial frost period. 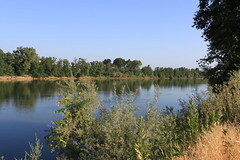 We find no merit in Forni’s assertion that the Water Board has exceeded its authority by declaring that the direct diversion of water in the frost protection period constitutes an unreasonable method of use in the meaning of the California Constitution and water code,’” said Professor Kibel. Example 5: The Sustainable Groundwater Management Act of 2014: “Why I’m noting this is that there are several provisions within this law that confirm and indicate that the legal basis for some of the provision in this law are grounded on the reasonable use law provisions in the California Constitution and the Water Code,” he said. “So since the adoption in 1928 of these constitutional provisions, we’ve seen a number of instances in which both the courts and the State Water Board have relied on its authority for the regulation of water resources,” Professor Kibel said. He then concluded by quoting the definition of doctrine and the definition of law as is written in Black’s Law Dictionary: Doctrine is defined as a legal principle that is widely adhered to. Law is defined as the body of authoritative grounds for judicial and administrative action. “Not quite the same thing,” Professor Kibel said. It was then Professor Harrison “Hap” Dunning’s turn to share his thoughts. The case also decided that riparians can divert for any consumptive use, including irrigation, he said. “That was the big one. This was litigation that involved some of the giants in the San Joaquin Valley,” he said. “Lux said that you can divert for any consumptive purpose, including irrigation, if reasonable. And here’s the critical point. They said what’s reasonable “depends on all the circumstances.” Depends on all the circumstances. Now what are some of the circumstances that one would look at if you examine the riparian use patterns?” A case in 1916 mentioned some of the things that a court would deem to be relevant, such as seasonal variation in flow, the amount of land irrigated, the extent of river frontage, and the comparative profit of the various uses, he said. With respect to the future use of reasonableness in California water law, Professor Dunning said he thought the State Water Resources Control Board should consider the reasonableness provision with some of the more serious overdraft situations that around the state. “In some of the more drastic groundwater overdraft situations, I think it would be very appropriate for the State Water Resources Control Board to think about the authority under the Reasonable Beneficial Use provisions of the Constitution in appropriate cases to go forward,” he concluded. “I think we’re going to see a lot more of that around California — this sort of combination of reasonable and beneficial use regulatory pressure redefining these water rights and negotiations to let market forces sort of help solve the problem,” he said. “So in the end, I think we’re going to do a lot more arguing about reasonable and beneficial use in the next, say, 20 years than we have done in the last 87 since it was made a part of the fundamental law of California,” Mr. Leshy concluded. More from the California Water Law Symposium with a panel discussion on reasonable use and the Russian River frost protection regulation.